During holy grail transitions I am missing the possibility to use different ND Filters in front of my lens - this would help to avoid the choppy kind of video where the shutter speed is very high. During regular video we strive to use a shutter speed in the order of 1 divided by frame rate x 2, e.g. 25 fps = 1/50 of a second to keep the balance within the frame between crisp steady and slightly blurry moving objects. In day to night timelapses I keep the lens fully open, thus have to use shutter speeds of 1/2000 or even 1/4000 sec during the bright parts of the ensuing video which makes for a not-very-cinematic look. When I use ND filters, LRTimelapse has no way to recognize the removal (or addition) of ND filters, so holy grail wizard can't deal with this. I don't know if it would be possible to integrate a functionality like this, but I would even be ready to write this information into the EXIF data manually. 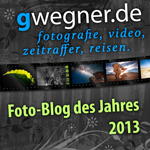 This post was last modified: 2017-07-24, 09:49 by gwegner. in my opinion removing ND filters while shooting is not a really good idea. The main problem is, that right after removal the images will get much brighter. The chance of blowing the succeeding shots is very high. Additionally any removal will not only cause a change in brightness, but also a more or less subtile change in color rendition that can be a pain to remove seamlessly. 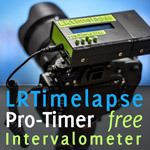 I'm not speaking of limitations in LRTimelapse - you can do both with LRTimelapse. making LRTimelapse "Know" about the removal and treat it like an exif data change to be able to use the holy grail wizard to compensate: select the region with or without the ND filter, then use "Metadata/Define Aperture (Lens Tagging)" to write a correspondent, different Aperture for that region. The "real" aperture does not matter at all. Just see those values as relative. For example - if you have the first 100 images shot with a 3 Stops ND and then removed it, set the aperture for the first 100 images to 8 and the aperture of the last images to 2.8. This is equivalent to a difference of 3 stops. Run the keyframes Wizard again, this will mark the removal of the ND with the small orange triangles, run the Holy Grail Wizard again. to compensate for the changes in color rendition: set a regular keyframe to the image right before the change, then one right after the change (overwrite the orange triangles with regular keyframes). In Lightroom edit those two keyframes so that they look similar. Ok - now that you know that it's possible, let me repeat that I don't do it. Instead I use qDslrDashboard to do the auto holy grail ramping with "Aperture Ramping" enabled. 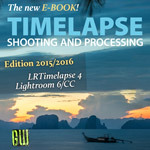 This gives me a much broader range of ramping possibilities and allows me to start with longer exposures. Mostly I start with f/11 and set the widest aperture to f/5.6. Now I set it to ramp automatically. When the iso starts getting higher and it's already quite dark, I change the widest aperture to a wider value. This prevents vignetting from getting too visible. Hope I could help. I will move this to faq. Thanks for the consideration Gunter - makes sense! Will try both methods & post my experiences.